Turn things around with a seven-piece reception furniture set from the Rotunda Series. 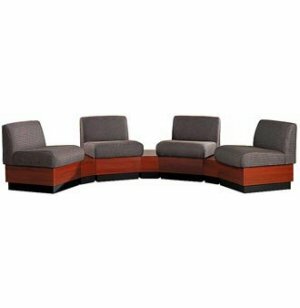 Wedge tables and reception chairs can be assembled in a variety of different curved arrangements. 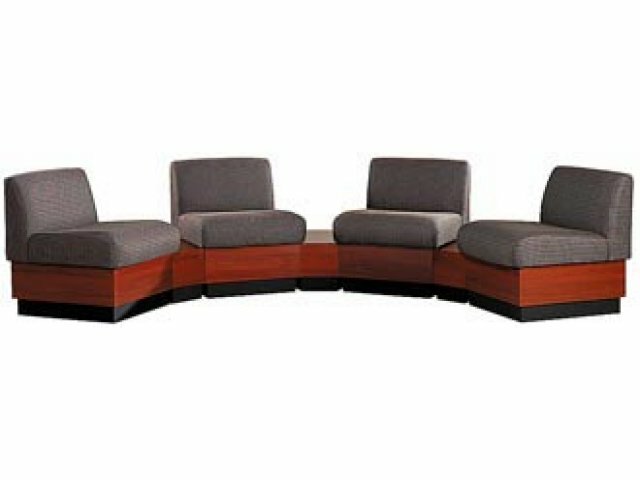 High-pressure laminate and plinth bases are designed to resist damage and complement your choice of upholstery fabrics. Rotunda Reception Furniture gives you the versatility and appearance of custom pieces at a remarkable price. Options is the key word for this collection. Its modular design adapts to any room shape or dimensions. The full series offers waiting room chairs and reception tables in a myriad of shapes and sizes, you can create contemporary flush curved configurations, classic straight rows or any layout you can think of. The subtle modern style fits in with almost any decor, with great upholstery and laminate finish options for maximum coordination. Rotunda Reception Furniture is built to keep your clients waiting in comfort for years to come. The base design includes heavy-duty frames, matched with reinforced joints for long-term use. Choose from the complete series for your ideal combination of plinth or black laminate base, or fully-upholstered reception chairs and accent tables to create the seamless flow of appeal you have always dreamed of for your lobby or waiting room. Full Set: Includes four RLS-401 reception chairs and three RLS-425 Wedge Reception Tables. Maximum Capacity: Corner units help you utilize every part of the room. Low Maintenance: Stain resistant fabrics keep your furniture looking great with very little effort. Comfy Seat: Cushions are made of firm, molded foam, which provides great support. Durable Material: High-pressure laminate sides and tabletops resist moisture, stains and scratches. Resists Damage: Textured black vinyl plinth base is recessed to reduce scuffs. Unlimited Possibilities: Full series of wedge seats and table options let you create virtually any configuration you desire. Sturdy Support: Heavy-duty frames with reinforced joints keep your furniture standing strong for many years to come. Custom Look: Flush ends create a custom look and offer easy configuration.